I found some bulbs in the back porch a few days ago. Some of them had started sprouting in the bag! We had bought them back in September/October to plant for the spring. Oops! The bulbs said to plant out October to December. It is only the 12th January.. maybe they’ll be good? I hope so because we planted them today! Once the bulb planting had finished (actually once the kids had given up and left the bulb planting to me! ), they got on with the more important job of playing. Ben went into the playhouse and told me he was selling pizza to all the boys and girls, while Jasmine got the Space Hopper out. Thomas found a couple of empty plant pots, some wood and a small paving slab and made himself some scales! 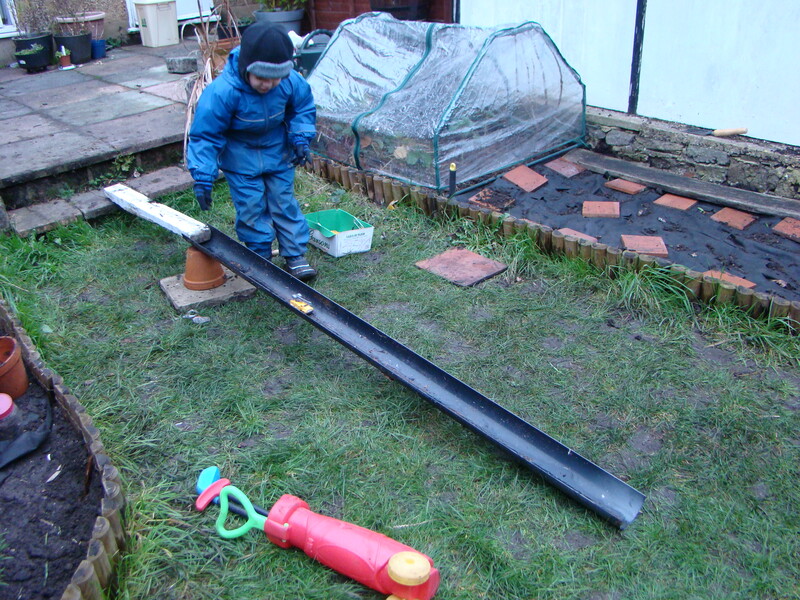 Then he added a piece of guttering, made a ramp and rolled balls and cars down it.